The Town of Milton is well-situated to provide a vast array of outdoor activities. There are three public fishing areas in town – two with boat launch ramps. From these access points, you can enjoy both Wagamon’s Pond and the Broadkill River. The Delaware Division of Fish and Wildlife manages the access areas in cooperation with the Town of Milton. In addition to fishing (2013 Delaware Fishing Guide), many enjoy the scenic rides down the Broadkill River through unspoiled hardwood forests and wetlands. The Nature Conservancy operates the Edward H. McCabe Preserve on the south shore of the Broadkill – just a couple miles east of Milton. This preserve is open to the public and features extensive nature trails. Just a couple of miles west of town, the Nature Conservancy operates another public access preserve, the Pemberton Forest Preserve with the Ponders Tract Trail System. Ponders Tract Trail System Brochure PDF. To the east, you will find the 10,000 acre Prime Hook National Wildlife Refuge. Birdwatching, photography, fishing, hunting and hiking opportunities abound in this ecologically diverse tract. Guides to the Prime Hook Canoe Trail and the Prime Hook Hiking Trails are provided here. The refuge headquarters has much more to offer, too. 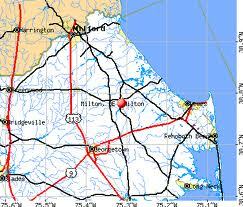 South of Milton is Delaware’s largest State Forest – the Redden State Forest. With over 44 miles of trails, the 16 tracts of Redden State Forest are popular for hiking, horseback riding, bicycling, and bird watching. Redden’s large timbered tracts are also ideal for deer hunting. Our southern regional office is located at the Headquarters Tract on East Redden Road. This tract also has a limited number of primitive camping sites and a small, catch-and-release fishing pond. The Headquarters Tract also contains a natural resource education facility, formerly a historic carriage house, which opened in 2000 (for more information see the Forestry Education page of our website). Additionally, the historic Redden Lodge, renovated in 1996, is open to the public at a nominal cost. Weekend, daily, and night reservations are available. The Lodge has a complete kitchen and is handicapped-accessible although overnight visitors must bring their own sleeping bags or cots, as there are no sleeping facility.